Steven Sharpe, who charted an ambitious course for Opera Santa Barbara over 11 years, spearheading the company’s first world premiere and otherwise elevating its stature through a series of new and expanded programmatic initiatives, is stepping down as general director. The company will immediately conduct a nationwide search for his successor. Under Mr. Sharpe’s leadership, Opera Santa Barbara’s budget more than doubled, and the company successfully transitioned from the Lobero Theatre to the much-larger Granada Theatre. In addition to expanding OSB’s Noontime Concert series and in-school educational offerings to venues in Northern Santa Barbara and Ventura counties, he organized several innovative outreach and fundraising events, including the multiyear lecture series “Opera on the Go” and “Opera al Fresco,” a concert held at Lotusland. In 2009, Opera Santa Barbara presented the world premiere of Séance on a Wet Afternoon, which the company commissioned Stephen Schwartz to compose. Mr. Sharpe also was instrumental in the expansion of Opera Santa Barbara’s artist residency program. Since 2009, attendance at Opera Santa Barbara performances has totaled nearly 46,000. Ticket sales in 2016-17 were up 19 percent over the previous season. 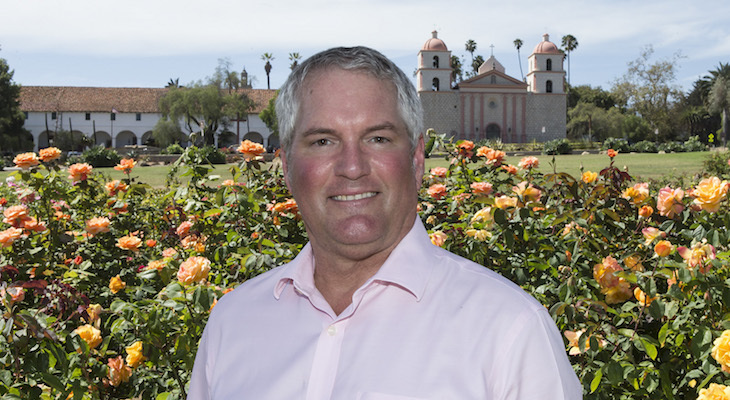 Prior to being named general director of Opera Santa Barbara in April 2006, Mr. Sharpe served as the company’s general manager and consulted on development matters. He began his nonprofit career as director of development and executive director of Pacific Pride Foundation/AIDS Project Central Coast, and has also served as executive director of the Dream Foundation and general manager of Camerata Pacifica. Mr. Sharpe has provided strategic planning and fundraising consulting for Antioch University, Community Counseling and Education Center, the Santa Barbara County Arts Commission, and the Greater Santa Barbara Ice Skating Association, among others. He currently serves on the Board of Directors for Hospice of Santa Barbara, and is a spinning and yoga instructor at the Santa Barbara Athletic Club. His resignation as OSB general director is effective July 14. Founded in 1994 by Marilyn Gilbert and Nathan Rundlett, Opera Santa Barbara is committed to presenting productions and educational programs of the highest quality. Over more than two decades the company has staged more than 50 operas and devoted thousands of hours to community outreach. The organization remains dedicated to the core passions that animated its founding: celebrating and championing the breadth and beauty of opera, and contributing to the cultural enrichment of the Santa Barbara community. Additional information is available at www.operasb.org.